Few people will give away precious space on their phone for a simple feature or gimmick. Consider the broader context of your app and how you can create a story about your app, how it fits into your customer’s lives, and how it connects with other digital aspects of your brand. All too often, companies launch an app but make it very difficult to get in touch with them. While an app can potentially increase the number of customer queries, it’s vital that you make it easy for customers to contact you if they need to. It’s easy to forget about an app’s existence if it goes quiet for long periods of time. Push notifications need to be set up intelligently (according to preferences, target audience and demographics) so that you can remind people to check out the app at periodic intervals. You can also use your social media profiles and email marketing to remind people to participate in or use your applications. Don’t spam your users, but make it hard to completely forget about you. Make logins and account creation simple, easy and quick. Don’t overload users with information from the get-go. Focus on giving them the information they need and helpful tutorials. 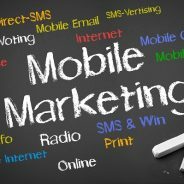 Need help with your mobile marketing or other digital marketing initiatives? Then contact WSI OMS today.